iTune is the best place for streaming music. And you can download some music on iTunes for free but with limited choice. So is there any way on how to download music from iTunes for free without limitation? Look no further! Here is an easy way to download any music from iTunes free of charge. 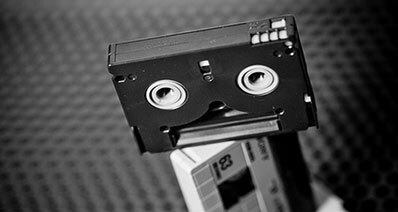 Before downloading music from iTunes, you need to pay for it. It is the process to get iTunes Music. Actually, you don't have to pay for it. If you can play it before purchasing it, then you can get it without paying. 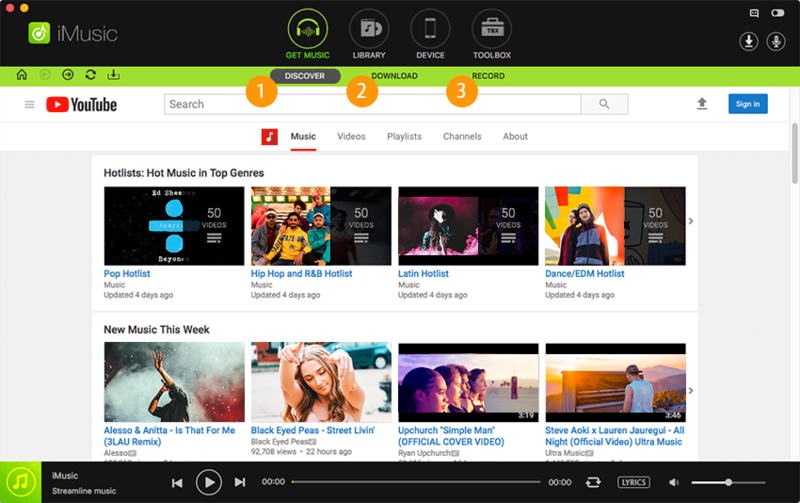 iMusic is a software tool for you to download music from iTunes and iTunes Radio. You can use the "Record" feature to record iTunes music. 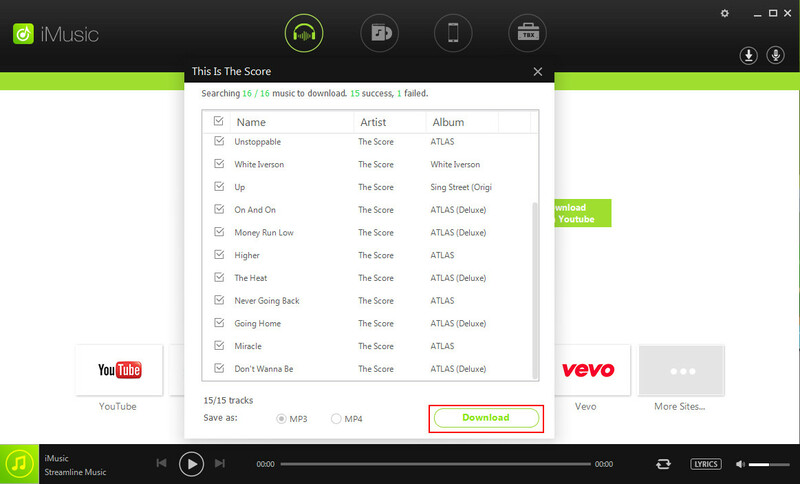 Click the Download button to get the latest iMusic installation package. After then, click the installation file and follow the wizard to install iMusic music downloader on your computer. Separate version for Mac and Windows PC are available. 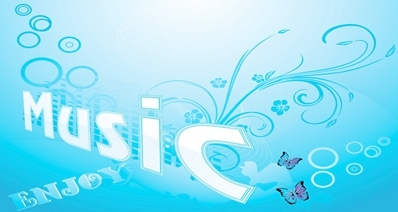 Launch the software and click "GET MUSIC" in the main window of the software. Click "RECORD" to see the management window. From there, click the red record icon. Go to iTunes and find your favorite music. Play the music on your computer. This program will start downloading music. During the process, iMusic will detect the ads and gap automatically and filter out ads and gap, but getting you the information for recorded music, including album, artist, cover and more. 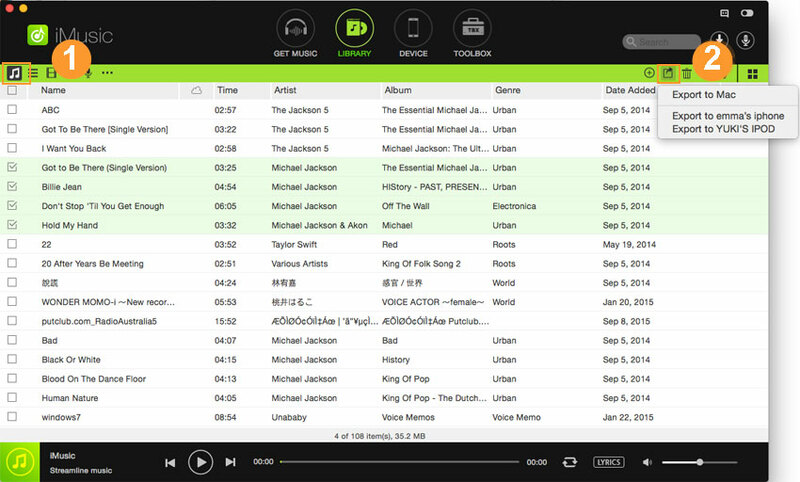 During the recording process, when a song is finished to record, it will be saved to iTunes Library automatically. 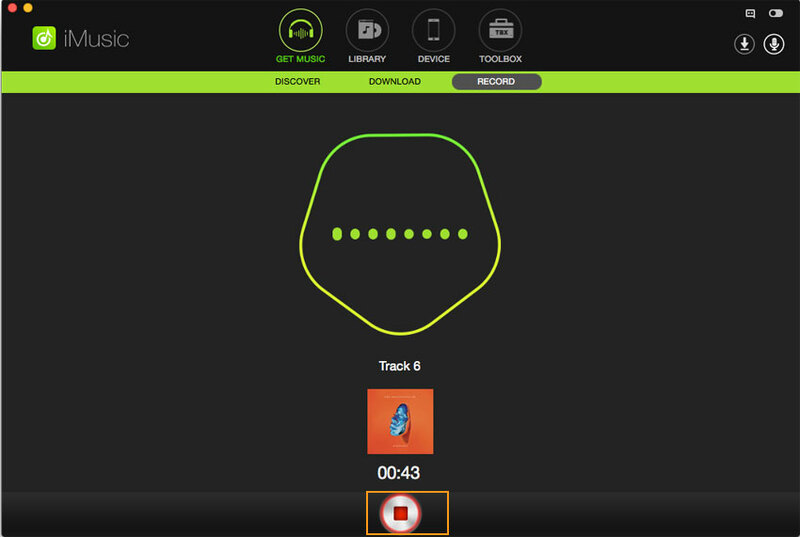 Click "LIBRARY" on the top of the software, then click the microphone icon, next you'll see the recorded songs. You can select one song to play it by clicking the Play button at the bottom of the software, or right-click on the window, select Add to to transfer to your iPhone, iPod, iPad. Transfer purchased and none purchased music from iTunes to iPhone, iPod, iPad and Android. 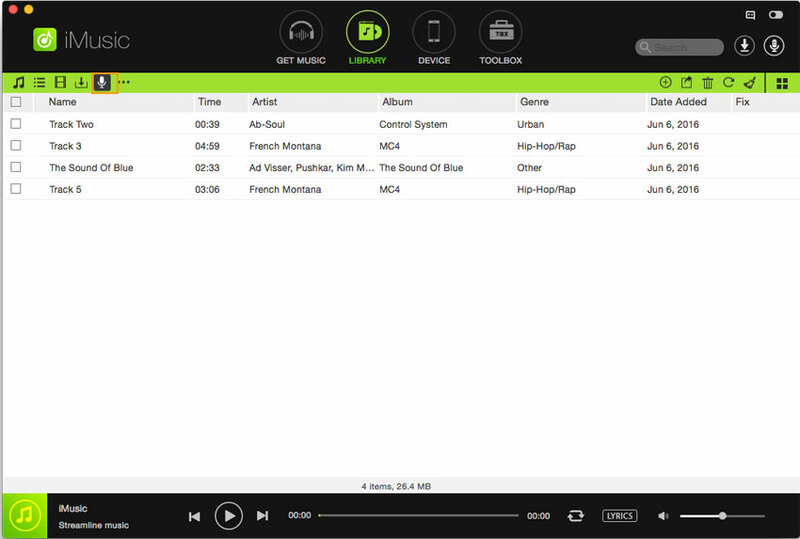 Copy music and playlist with rating and play counts from iPhone, iPod, iPad and Android phones to iTunes. 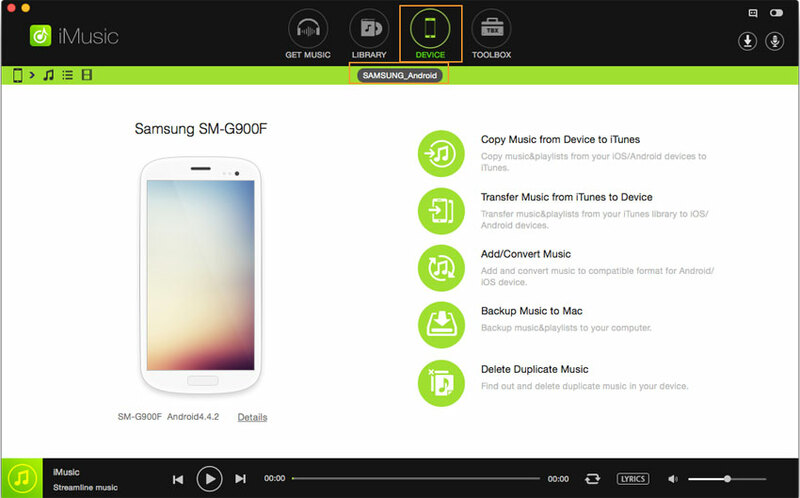 Convert songs, videos and other media files to fit iPhone, iPod and iPad. Clean up broken tracks, fix missing tags for music in iTunes Library. Download and install iMusic on your computer. Next, connect your iPhone, iPod, iPad or Android phone to your computer via a USB cable. When connected successfully, your device will be displayed in the window of "DEVICE". 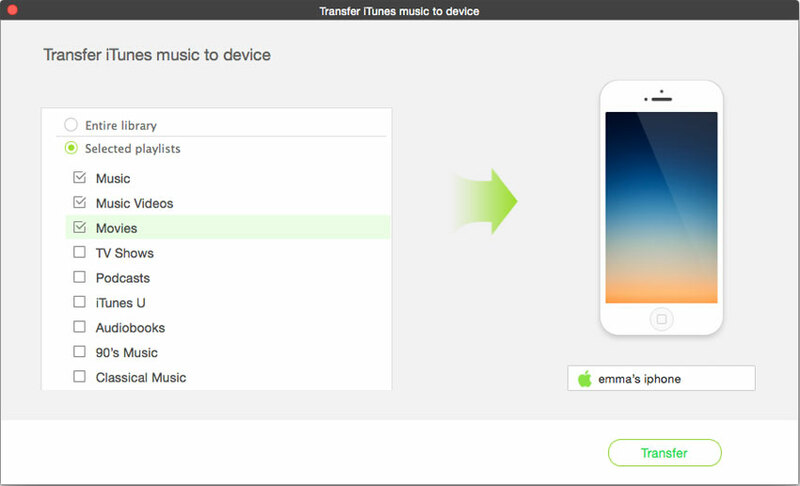 In the "DEVICE" window, there is an option "Transfer Music from iTunes to Device". Click it to let the software scan your iTunes for the file types. After then, choose the file types to transfer. Click "LIBRARY" on the top of the software. It is the quick access to iTunes Library. There is a music icon on the left side. Click it to display all music in iTunes Library. Check to select music file, and click the Add icon. 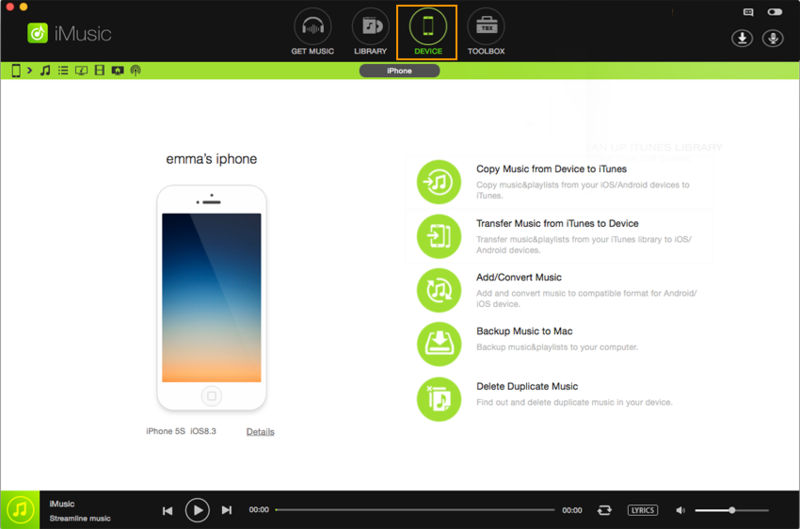 From there, select your device to transfer music from iTunes Library to iPhone, iPad, iPod and Android phones. If you have purchased music in iTunes and want to download or redownload iTunes music, just follow the below guide. Step 1: First, you need to authorize the computer for downloading iTunes purchased songs. To do so, launch iTunes and go to “Store” > “Authorize This Computer”. Then log in your Apple account and click “Authorize”. Step 2: In the iTunes main interface, go to “Store” > “Purchased” to view your items. Step 3: At the bottom right corner of iTunes interface, click “Download Previous Purchases”. Step 4: Then click the “Purchased” link and choose the “Music” option. Step 5: Now choose the song you want and click the Cloud icon with the downward-pointing arrow to download iTunes music.